Stop wasting your time reading books that aren’t right for you, are guilty of survivorship bias, or you picked them up at a bad time. 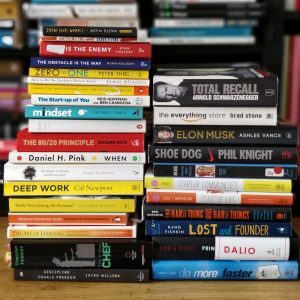 Our mission at The CEO Library is to cut through clutter and guide you towards the BEST books that will make a difference in your life, challenge your assumptions and accelerate your learning. A weekly newsletter with neuron-expanding ideas that will inspire you and help you constantly improve. We’re curating those ideas from books or other forms of interesting content (articles, interviews, podcasts – we don’t discriminate, as long as there’s something to learn). A monthly reading plan for aspiring entrepreneurs, created by Bobby Voicu, my friend and partner at The CEO Library. He talks about the books he’s read in the last 10 years and really made sense for him, as he went through his startup / entrepreneurship experiences. They will help you understand what you should expect on your chosen path, and what you need to know to have the basics well in place. The very moment you subscribe, you’ll also get a free copy of the book ‘The Prince’. Although it was written 500 years ago, Machiavelli’s work still offers remarkable insights on leadership. Joining our mailing list can be an investment in the best asset you have: yourself. Decide on your own if this is the case and sign up below. It’s free. Of course, it’s up to you to also put those lessons into practice. If you’re not willing to change and do the hard work, no amount of knowledge in the world can help you. Start with getting better at saying No (which is also an example from our newsletter). And if you find value in our work, you can support our work on Patreon.